The most critically ill of Emory’s four patients with Ebola was admitted to the Serious Communicable Disease Unit on Sept. 9, after becoming infected while treating patients in Sierra Leone. His identity remained confidential throughout his stay, at his request. Spending more than a month in Emory University Hospital’s isolation unit, he was placed on a ventilator and had kidney dialysis (a first for a patient with Ebola). Doctors in charge of his care feared he would die or suffer brain damage. "He was by far the sickest patient with Ebola virus that we’ve cared for at Emory," said infectious disease specialist Jay Varkey. After 40 arduous days, he was determined to be virus-free and was quietly discharged on Oct. 19. In early December, Ian Crozier broke his silence and went public about his experience with Ebola and his rough, unmarked road to recovery. Crozier, 44, was born in Zimbabwe and moved at the age of 10 to the United States, where he became an American citizen. He went to medical school at Vanderbilt University, then trained in internal medicine and infectious diseases. As Ebola spread in West Africa, he volunteered with the World Health Organization (WHO) at the Ebola Treatment Unit in Kenema, Sierra Leone, in August, planning to stay for a month or so. He encountered an overwhelmed heath care system with an overflowing ETU and patients who feared they had Ebola traveling there from all over the country. On clinical rounds in early September, he developed a fever and headache, and drew his own blood for a diagnostic test, hoping he had malaria. The next day, he found out he was positive for Ebola. WHO flew him back to the U.S., and he was taken straight to Emory Hospital for treatment. Although Crozier doesn’t remember much of his time in the isolation unit, his doctors realized early on that he was severely ill. The viral load in his blood was more than 100 times that of the other patients with Ebola that Emory had treated. "The general dogma in July was that if Ebola patients needed dialysis or a vent, they would invariably die," says Bruce Ribner, director of the unit. "I think we have shown that is certainly not the case. We’ve changed the algorithm for how aggressive we are going to be in caring for patients with Ebola." Ribner also believes that Crozier’s age may have worked against him. "Both nurses who acquired Ebola were young and recovered fairly quickly," he says. "It seems that younger patients do better. And the higher the virus load that you’re infected with, the worse your infection will be." Crozier’s family and girlfriend kept a vigil outside his room at the isolation unit, reading to him through an intercom and giving his nurses personal photos to tape on his wall. A nurse who had also been infected in Kenema flew to Emory from England and donated several units of plasma for a transfusion. Crozier’s virus levels began dropping, but his kidneys failed. He started having heart arrhythmia. In all, he was on a ventilator for nearly two weeks and on dialysis for just over three weeks. "The really tough part was the thought that he was going to die and that I was not going to be able to touch him before he left the earth," his mother told reporters. Finally, his viral levels dropped and his condition stabilized enough for him to be quietly discharged from the unit. He went to Phoenix with his family to recover. He emerged from the hospital 30 pounds lighter, and has since struggled with fatigue and deconditioning as well as inflammatory eye disease. "Though I have struggled with some clinical setbacks in December and January, I’m feeling much better and getting stronger more recently," Crozier says. "My appreciation for the kind of care I was privileged to receive then and now at Emory continues to grow. I will always be grateful for the way this remarkable Emory team fought tooth and nail for me when I could not, and continues to fight for me now." 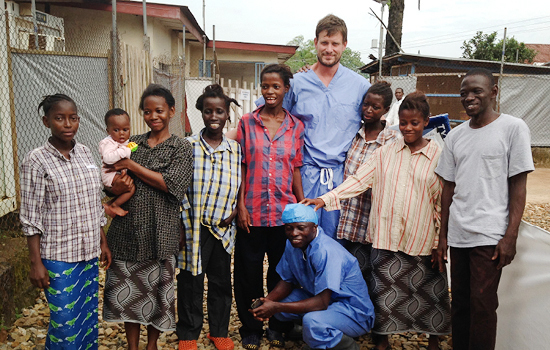 Lessons learned in caring for Crozier and the other Ebola patients continue to ripple through the medical community. For example, doctors now have a model for safely and effectively providing dialysis to Ebola patients who experience kidney failure, which involves special, extensive training for ICU nurses performing the dialysis. The Emory team reported this protocol at the annual meeting of the American Society of Nephrology in Philadelphia, and it was published online Nov. 14 in the Journal of the American Society of Nephrology. "One of the things Ian taught us was, you can get sick enough to need these types of interventions, and you can still walk out of the hospital," Ribner says. "I think it has sent a message to our colleagues around the world." "Ebola Fighters: Ribner among those honored as TIME's Person of the Year"
"Ebola Survivor Nancy Writebol: Giving Back and looking forward"
"The Long, Extraordinary Recovery of Ian Crozier"